Among all the details you need to take care of when you’re moving, it’s important to prioritize packing the first and last box you will open in your new home. Whether you’re moving across the street, across the country, or even across town, one box, or even several, rules them all, err, something like that. This is what we call the “OPEN ME” first box. From the many times I’ve moved, from one country to another, across town, for college, and relocating to a big city, I’ve always made sure to pack a few of these vital boxes. These boxes should be carried with you. Your car is the safest place to put them, or -somewhere you know they’ll be safe with you – not with the movers. The boxes should easily be accessible to grab when you finally arrive at your destination. Here are a few suggestions what to pack for those “open first” boxes in each room. We hope this helps you feel prepared, worry less and quit wondering where the heck you put your contact lenses case or where you left your cell phone charger when you run out of juice in the middle of your move. Paper towels for cleaning dirty kitchen counters – You may need two! A bottle of bubbly – come on, you’ve just moved, it’s the perfect reason to celebrate by popping some champagne! (Do this after the movers leave). You’ve celebrated your move, and we hope everything went well. Now you may just be exhausted and grubby and after a long day; a shower may just do you some good. Along with some toiletry essentials, be sure to pack your bathroom “open first” box when you need it. Hand towels and bath towels for each family member. Shower Curtain – we know you won’t have time to install the fancy decorative curtains but for now, the basic plastic one will do fine for the first few days. Make sure you pack this “open first box” with some necessary items for the beds. This box should contain bed sheets for all the beds you will be using for each member of the family, along with blankets and comforters, pillows and pillowcases. In this box, you may want to put an extra set of clothes for you and the children as well. Old clothing – Include an old sweatshirt or piece of clothing so they can smell you. This always works for my cat. Yes, I’m a cat owner (not a crazy cat lady though), I’ve moved across Texas with her. Let me tell you, it can be successfully done. Before unpacking, there will be lots of dusting and basic cleaning to be done around your new home. We recommend a few cleaning supplies. Chances are, things will need to be wiped down before they can be used. Broom – there will be lots of debris from coming in and out of the home and will accumulate with many feet moving in and out of each room. Mop – you’ll want to have this handy in case it’s raining or snowing out. That way your belongings won’t get dirty. Rags – If you packed with newspaper, you can use that to clean windows.This open first box is the most important one to keep with you while in transit to your new destination. Don’t leave these to the movers. I’m talking about your documentation, whether it’s moving documents, debit/credit card, bank records, medical insurance, receipts, and other important files you don’t want anyone else to handle. These should all stay with you and be put somewhere you know they will be safe.Unpacking should be a piece of cake, if it’s done right. Set up a system where each box is designated to a specific room to be opened first. This will ease your transition and make each box easily accessible for your first night. Instead of using cardboard boxes, try using large plastic bins. 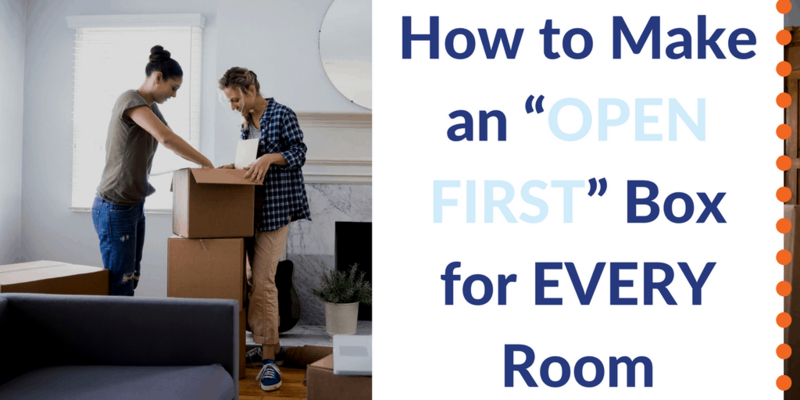 They should be packed in the car ready to open first once you arrive.When you arrive to your new place, these “open first” boxes will be crucial to your first night. Keep calm and organize, organize, organize. Trust me, this will ease all of your moving troubles and stress by making it just a little bit easier and smoother for you. If you don’t like to organize, good luck trying to find your toothbrush and the bed sheets among your forty boxes on your first night’s sleep.Okay fine, so that may be one, two or six boxes, but you get the idea. Make a list beforehand. I’m a big fan of planning ahead. Pack the things you know you will need on the first night so you don’t rummage through all of your boxes. This will definitely help you once the movers finish unloading. Open the essentials boxes, take a shower, make the beds and go to sleep so you can rest the night and wake up ready for a new day in your new home.Congratulations! You’ve made it through the first night in your new place. Did we miss any other tips on what to pack for your “open first” boxes? Tell us in the comments below if you have other ideas. Remember to keep calm and carry those boxes on! Know someone who’s moving soon? Be their hero and share this article with them!